Recorded in several spelling forms including Hasely, Hazeley, Heasly and Heasley, this is an English locational surname which is also well recorded in Ireland. The origin is believed to be from either the village of Hazeleigh in Essex, recorded as "Halesleia" in the famous Domesday Book of 1086, or Hazeley in Hampshire, which appeared as "Heishulla" in the Pipe Rolls of 1167. The former place in Essex is composed of the old English personal name "Haegel" plus the second element of "leah", meaning an enclosure in a forest. The place in Hampshire derives from either the initial old English "ghaeg", also meaning enclosure, plus the second element "hyll", the old English word for hill. Hence this placename may translate as the "enclosure on the hill". Examples of the surname recordings taken from early surviving church registers of both England and Ireland include : Ciceley Hasley, who was christened at St. Giles Cripplegate, in the city of London, on September 1st 1616; Margaret Heasly who married Edmund Pope at Cloyne, County Cork, on June 1st 1697, James Hazley who was christened at St. Mary Whitechapel, Stepney on January 31st 1759, and James Heasley who married Mary Johnstone at Ballinderry, Ulster, on September 2nd 1846. 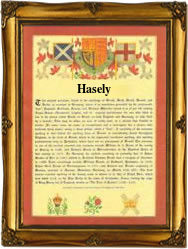 The first recorded spelling of the family name is believed to be that of Henry Hasloy who married Ann Hire at the church of St. Mary the Virgin, Aldermanbury, city of London, in 1585. This was during the reign of Queen Elizabeth 1st known as "Good Queen Bess", 1558 - 1603. Throughout the centuries, surnames in every country have continued to "develop", often leading to astonishing variants of the original spelling.